There are numerous circuits to be made if one wants to work at the chip level. However components are available to accomplish this for those who do not wish to do it that way. 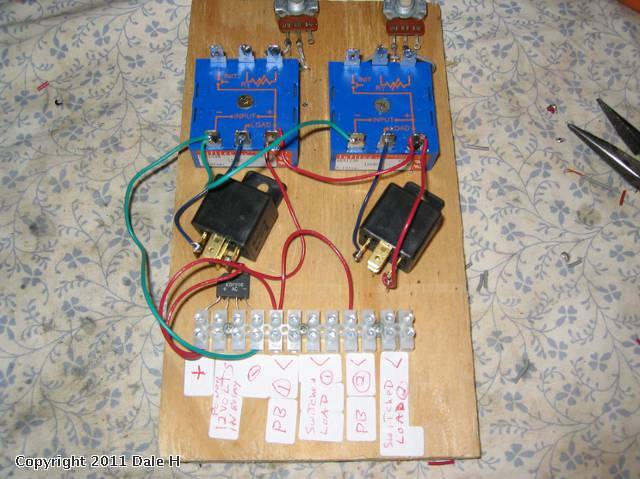 A forum member asked for 2 pushbutton circuits so that when a button is pushed,a carnival ride will go on for a minute or so ,then shut off. I found some Infetec timer modules in my parts bin made for just such a job. They are 12VDC modules designed to work with relays. Here is a schematic on how the timer works for timing an event up to a 3 minute duration. Relay and timer power will be supplied by a PWZW set at a 12 volt throttle. The throttle will be taped as a precaution so too much voltage is not applied damaging the timer. The capacitor shown in the schematic is not used in this application. It would be needed if used as an interval timer if power came from the insulated rail method. 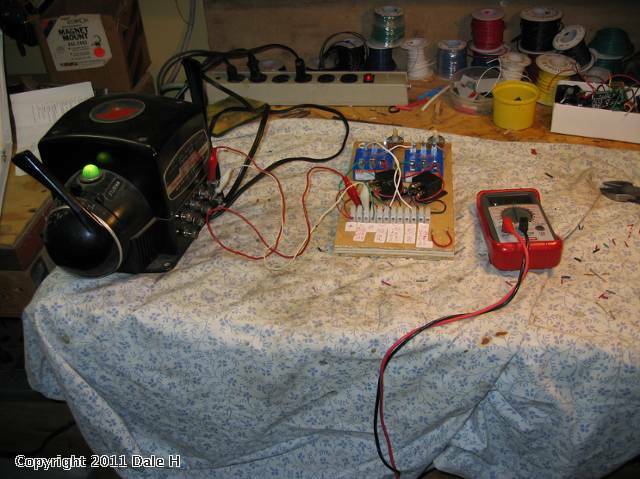 If using the capacitor multiply AC input by 41% less 1.2 volts for the voltage drop from the bridge. 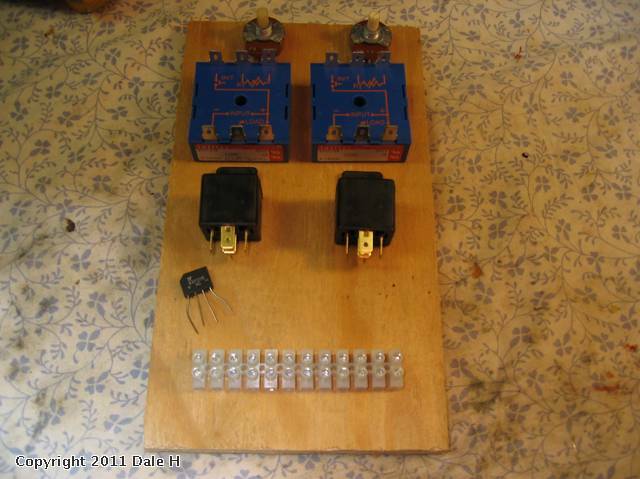 here are the components used to make the circuit. 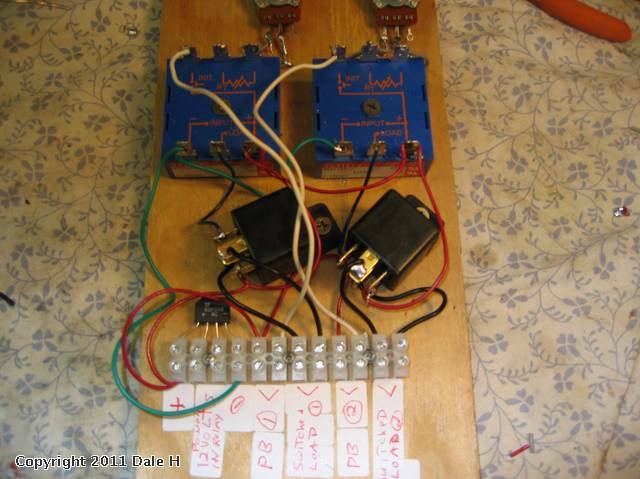 After soldering components are screwed down to the plywood. The blue square module has 6 pins. Fixed resistors could be used but instead 1 meg pots are used to allow adjusting duration. A eurostyle barrier strip is used for easy user connections and 1 bridge rectifier provides DC current for the modules and relays. The relays are 12VDC automotive,durable and cheap. 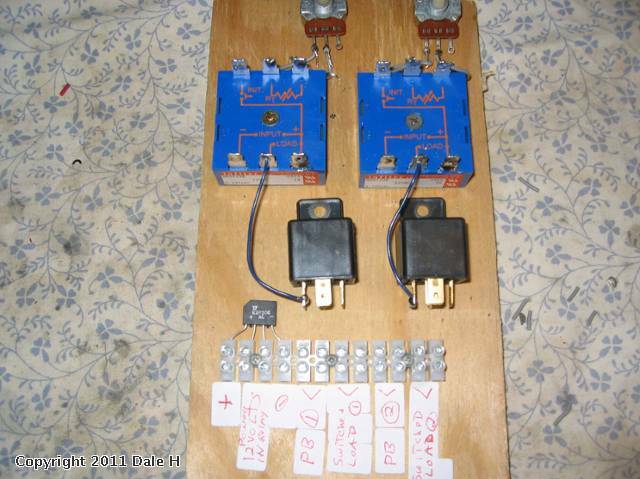 Cost of components are $8 per module and $2 per relay,$2 for the barrier strip bring the cost to $22 to make up the circuit. 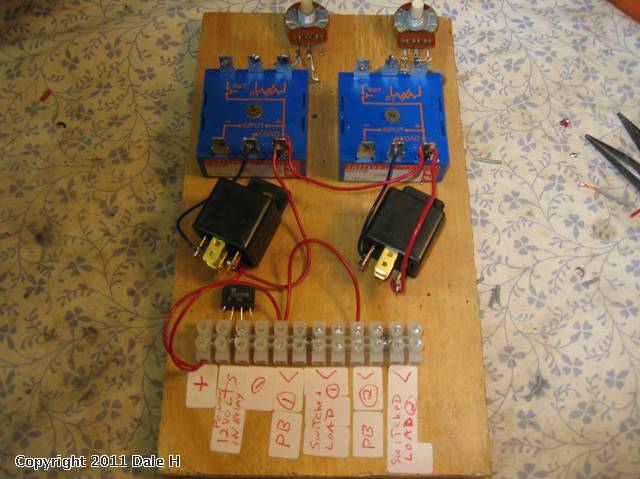 Anyone wishing to make this circuit I have a small supply of the modules. pairs of grey wires are soldered to the top center and top right terminals of the modules to the pots. The bridge rectifier is mounted in the barrier strip. A blue wire is soldered from the bottom center terminal of each module to the - terminal of each relay coil. This is switched -DC from the timer. 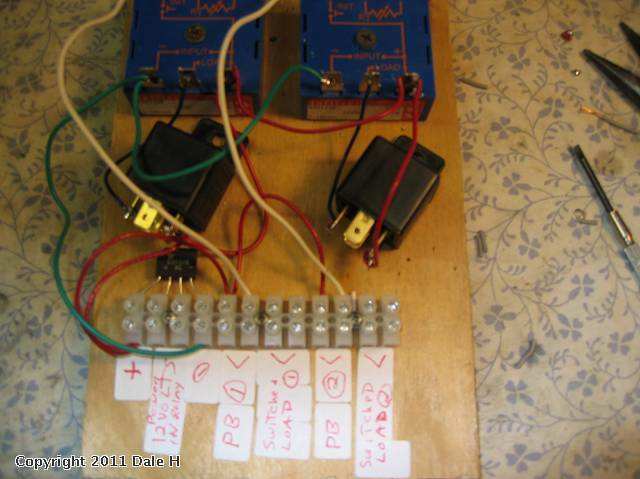 Next the red wire,+ DC is soldered to various locations per the schematic from the bridge rectifier. The black wires connect the common and normally open terminals of the relay contacts to the barrier strip marked switch loads 1 and 2. Size this wire according to load requirements,#18 is usually good for switching trains and big loads,#22-26 is fine for all other light loads such as a few lights or an accessory. Not shown because the picture did not come out was that a 1n4001 was soldered across the relay coils for spike suppression. Some relays have these built in but these did not.. The timer circuit (relay contacts) can power any event up to 30 amps load. The timer with the pushbutton circuit jumped can be used as an interval timer and used for applications such as train station stops using the insulated rail method. (see timed train stop circuit in the electronics section) I may post this circuit later along with other more commonly available modules. The infetec single shot is not that common.